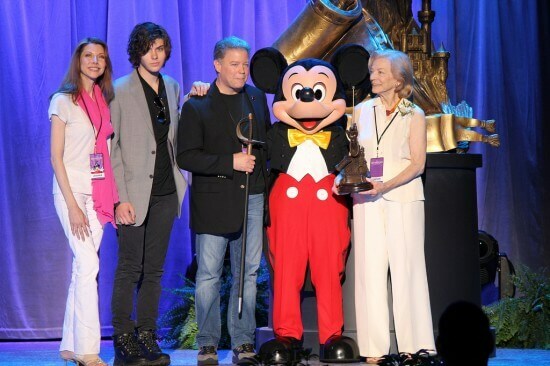 One week ago on the first day of the 2011 D23 Expo in the Anaheim Convention Center, the newest group of Disney Legends were inducted in front of a crowd of thousands of Disney fans. Since sharing the unforgettable performances by the honored Disney Princess voices as well as a few Muppets, I’ve been repeatedly asked to also offer a look at the speeches given at the ceremony – which you can now find videos of below. 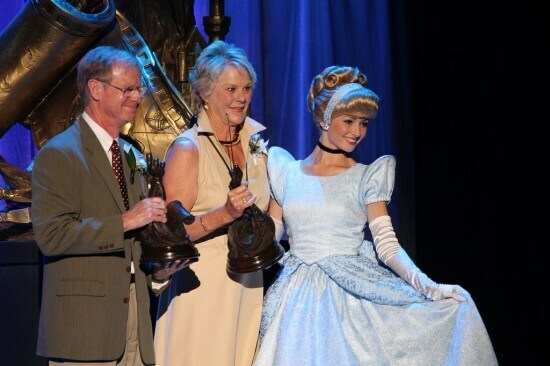 The Disney Princess voices were the first to be featured at the 2011 ceremony. The speeches they gave seemed to increase in emotion as they went along, beginning with a feeling of surprise from Anika Noni Rose and ending with the overjoyed Jodi Benson, expressing her appreciation for The Walt Disney Company and pride for being a Disney cast member. 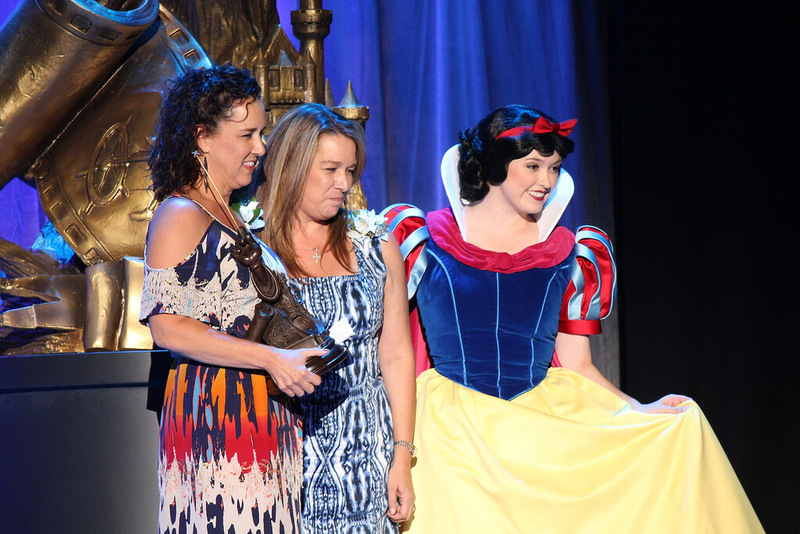 Following these heart-warming speeches, each of the Princess voices returned to the stage with Linda Larkin introducing the ladies who would each sing some of the most famous Disney songs in history, our videos of which have been viewed nearly 150,000 times in the last week. Make sure you don’t miss them, particularly the group performance at the end. Next the always animated Regis Philbin took the stage, after being introduced on video by his talk show co-host Kelly Ripa. He first joked around with Tom Bergeron, then shared a few amusing and energetic stories. It’s incredible that just yesterday he celebrated his 80th birthday. Wrapping up the ceremony, Lisa Henson took the stage to begin to honor her father, Jim Henson. Lisa is the current CEO of the Jim Henson Company and had wonderful thoughts to share about her dad. After her speech, attention was drawn to the main stage where a live puppeteering performance of “I’ve Grown Accustomed to Your Face” was performed by Brian Henson, Jim’s son, and Leslie Carrara-Rudolph. The routine was original performed decades ago by Jim Henson and his wife Jane, a fitting tribute to honor him as a Disney Legend. Don’t miss our video of that performance as well. Brian then gave a speech of his own, offering stories of what it was like to grow up with Jim Henson as his father, recounting that Jim used to accompany much of his life with sound effects, adding a sense of humor to all that he did. Once Lisa, Brian, and Sweetums left the stage, out rolled Kermit the Frog and Rowlf the Dog who performed “Rainbow Connection,” which left practically the entire audience in tears. Jim Henson originally performed this song as Kermit in 1979’s “The Muppet Movie” and it made a perfect tribute to honor the man after so many years of delighting millions worldwide. Again, don’t miss our video of the performance. 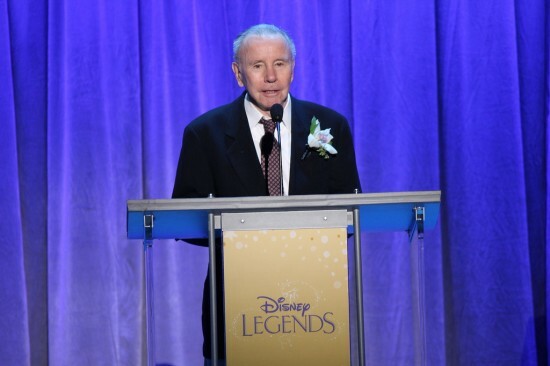 And so concluded the Disney Legends ceremony at the 2011 D23 Expo, filled with touching speeches and exciting musical performances. The audience of Disney fans could certainly see why these individuals were being honored, as they not only spoke humbly and sincerely about their gratitude for the awards they were given, but were also happy to share their talents with those in attendance. It was then quite clear why each of them have earned a spot as Legend.